My grandma's stories, which she began sharing with me over the phone in 2006, were the reason why we became best friends and the reason why I started The Best Day of My Life So Far. Every time I visit her in Seattle, I feel a surge of re-inspiration to reach out to more older people in more places and help their stories reach more young people. My visit home this time was extra special because it's the first time we sat together in front of my laptop to check out Best Day's new mission video. She doesn't speak English so I translated what our participants and interviewees say on screen to her, word for word. With each word, her smile grew. The organization's impact is really her impact – I told her I am so grateful that she's changed the lives of so many people. She simply giggled, as she always does when we talk about Best Day's growth, "I was just the first in line." She'll never brag. She's too cool for that. She's my hero. That's why I have been a little slower at posting stories on this blog the last couple weeks, because I have been soaking up my time with my family and especially my grandma. But I want to let you know, you guys are always on my mind!! Actually, this may be a good time to let you in on a little secret... our team has been creating more (crazy exciting) ways to deliver more stories to you than ever before! So if you ever feel that things are a little slower here on the blog, it's probably a sign that things are really picking up behind the scenes and we will have great things to unveil shortly. Stick with us and check back soon! 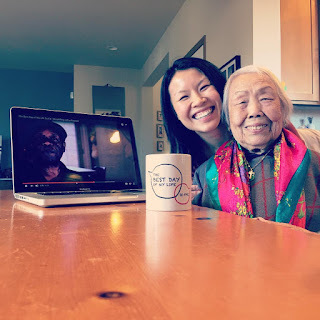 In the meantime, check out our video (with a grandparent or an older bud, maybe) and sign up for our newsletter so you can get the full scoop!